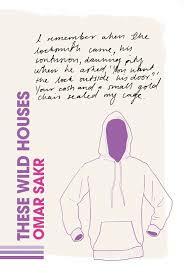 Omar Sakr’s debut collection opens its gauze doors, but soon leaves its readers on the threshold. It’s a compelling, if challenging, approach. Sakr reflects his subject matter at the level of the collection – experiences of displacement, destabilisation and disconnection, something Sakr’s own introduction says ‘should be rare’. These Wild Houses has a reader-centredness that at once invites and resists intimacy. The poems seem like direct tellings, where ‘you’ feature. At the same time, the collection is inward-looking – a playful and skilled balance Sakr strikes through his storyelling and linguistic incisiveness. I’m reminded of those first awkward tours of friends’ homes, something emphasised by ‘Echoes of Home’, which chronicles longed-for domestic sounds. 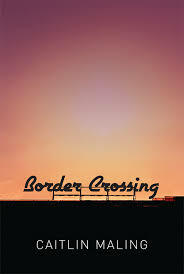 Precarious, estranged and bureaucratic, Caitlin Maling’s Border Crossing is of this time. With a gripping and parse text, she dissects borders’ many forms, turning her eye from Western Australia to rural and border America. on the wind and then the wetness bedding me in the bayou banks, asking me for roots. Despite its rose-tinted cover, the collection repels nostalgia. 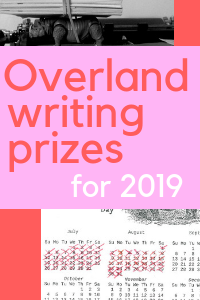 Its free forms resist comfort and pace – ranging from the page-long, regular ‘Closer’; to the stanza-numbered, double-voiced, doubly-metaphoric ‘February in Oregon’; to ‘Islands’, a list of 34 facts or commandments. ‘My fingerprints on the glass cannot be retrieved. is like the other boys who die in New Mexico. Gularabulu is not a new text. Originally released in 1983, a revised edition was published in late 2016. 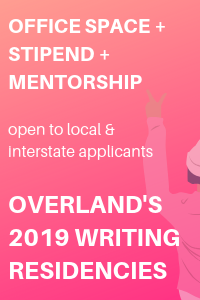 Roe (whose texts are spoken; transcribed by an ethnographer) launched a blak writing tradition. Some Indigenous writers now mirror its experimental intensity in conveying space, Lingo, story, colonisation and time. As a book with its institutional filters, Gularabulu can be a disquieting read. It is clad in notes: about Aboriginal English, explaining stories before they’re told, guiding pronunciation. Its transcription occasionally describes, rather than carries, Roe’s wordwork. His breaths, even background noises, are painstakingly noted. I describe this as poetry, perhaps incorrectly. Others call Gularabulu a story collection. These descriptions come about because Gularabulu is shaped for page, with line breaks to represent spoken rhythms and transcription breaks creating ‘unitary stories’. Gularabulu must be read with this in mind – this book is not itself the text, it is someone’s record of it. All the same, to read it is to descend into Roe’s deft word and narrative – at once politically urgent and nurturing. Roe’s texts, lengthy and varied in style, spill from history to devil stori to trustori. He not only shapes word and narrative dazzlingly, but accounts for himself in both. 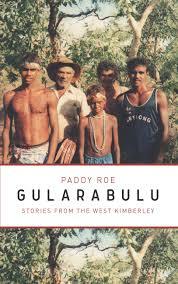 Gularbulu is a skilfully textured and dense text, poetry or not. It surprises and unsettles the reader without ever being tedious or opaque. 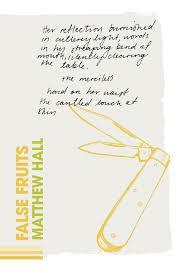 In False Fruits, Matthew Hall talks about the settler moment. His own introduction recalls a braided rope – plaiting archive to short story to paint a picture of how the Indigenous is erased by the establishment tales of settler nations. It’s an apt metaphor for False Fruits. Each page is regular – stanza one: one long line usually building a scene; stanza two: fewer than six short lines on action; stanza three: one long line about their result. Hall’s seven poems are long untitled, numbered braids made from these pages. That structure burns a rhythm. Through it, the reader is open to explore the collection as a story and critique without adapting to new forms or settings. It also makes for a droning read that not all will love. Colouring Hall’s poem-rope are metaphors of sustenance that are inseparable from their violence; bread, fruit and unfamiliar growth are underscored by their cost, and by their precariousness in the winter of a settler-resistant land. Although Hall writes about the frontier that made Canada, its similarities to what made Australia make it an especially reflective, but not a parallel, read. Anthology season has been a deluge. In the last few months, we’ve been spoilt with the Anthology of West Australian Poetry (Fremantle Press), Contemporary Australian Poetry (Puncher and Wattman) and Contemporary Australian Feminist Poetry (Hunter). 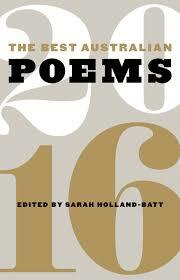 Best Australian Poems 2016 is among them. Its focus on 2016, a bad year but a good year in ‘minority’ poetry, is a useful point of reflection. These fresh-growth poets are concerned with decentralising and justifying verse to transform what it can do, and why it does it. Evelyn Araluen Corr’s poem ‘Learning Bundjalung on Tharawal’ is like a nose-breaking punch. 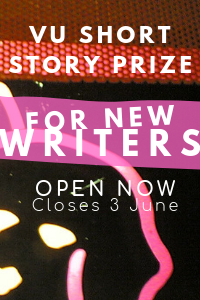 It comes, in a sense, pre-vetted: it was shortlisted for Overland’s 2016 Nakata Brophy prize. It makes Lingo its subject and its poetic instrument, all the while mapping the work of relearning what the body and land knows while the two are disjointed. Her language and use of the page are technically exciting, and reflect the knowledge that makes them. Eileen Chong’s ‘Magnolia’ looks to Hua Mu Lan, a legendary figure in Chinese history whose story has been (very imperfectly) retold in popularised forms. Chong’s telling, drawn from ballad histories, is unquestionably better. In form it mimics historic text, divided into sections denoting scenes. ‘Magnolia’ opens with two vignettes. One, Hua Mu Lan washing secret menstrual blood at a war-camp dawn; two, her killing a chicken. Chong’s skill in structure and tone brings the poem’s most visceral surprise – the violence of war itself is never in frame, and yet between hiding blood and betraying a pet ‘Magnolia’ is a hauntingly violent work.